The Philadelphia Eagles lost Carson Wentz to a season-ending knee injury and could be in need of quarterback depth. As has happened with numerous teams with quarterback injuries this year, many fans were quick to speculate that Colin Kaepernick might be a suitable candidate to join the Birds before their playoff push. While Kap’s return to the league is unlikely, he’s a unique fit for the Eagles needs in that he is a mobile quarterback that has experience in big games. After Carson Wentz’s season officially ended due to a torn ACL, Philadelphia sports fans began to speculate on ways to save their promising season, and one name has come up in multiple circles of water cooler conversation: Colin Kaepernick. Kaepernick has been out of the league since asking for his release from his contract with the San Francisco 49ers last season. Since then, he has filed a grievance accusing NFL owners of collusion, and the protests of police brutality and systemic racism that he helped begin received newfound attention due to President Trump’s harsh criticisms. Despite Kaepernick’s controversial position in the NFL world, many Philadelphia fans immediately considered the former 49ers signal caller as a solid player to bring in after the loss of Wentz. While backup Nick Foles was decent on Sunday, helping to lead the Eagles to a comeback win over the Rams, the Eagles’ quarterback depth is now effectively shot, with former Indiana quarterback Nate Sudfeld now on deck to take over in case anything happened to Foles. Kaepernick hasn’t seen NFL action in a year, but he’s a proven commodity and a dual-threat quarterback, and it’s fairly easy to see him excelling in the Eagles’ zone-read-reliant offence. He also has some of the escape-artist ability that has made Wentz so successful for Philadelphia this season – a skill in stark contrast to Foles’ limited mobility. Hall of Fame wide receiver and FS1 analyst Cris Carter seemed into the idea of Kap suiting up for the Eagles. Additionally, many in Philadelphia media were compelled by the idea of a potential Kaepernick comeback in the City of Brotherly Love. Kyle Neubeck at PhillyVoice called for the Eagles to at least have a conversation with Kaepernick, arguing that while he would not supplant Foles in the starting role, he possesses the skills necessary to serve as the team’s “break-glass-in-case-of-emergency option” should the worst happen. Eliot Shorr-Parks at NJ.com also called for the Eagles to contact Kaepernick, arguing that Nate Sudfeld is an insufficient backup for the Eagles in their current state. Across Twitter, many expressed their hope for a potential comeback from Kap. I can’t process Nate Sudfeld being the backup on this team. Gotta give Kaepernick a call. Eagles get Kaepernick and just off Karma alone they’ll win the Super Bowl. 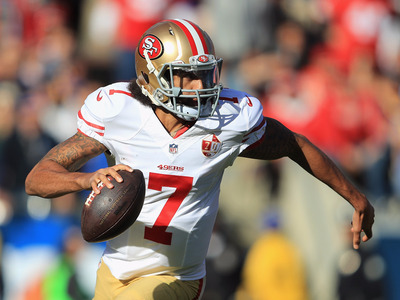 Of course, the likelihood of a Kaepernick return is still something of a pipe dream. For one, Kaepernick made clear from the outset that he wanted to come back to football to play, and while there are many that would argue that Kap is a better player than Foles, the latter has proven he can win with the Eagles and is likely one of the best backups in the league – there’s no reason to bench him simply to throw a flyer on Kaepernick. The idea of Kaepernick’s potential return to help save a once-promising team in too sweet not to savour. And if the 2017 NFL season has taught us anything, it’s that anything can happen.